Just give me a dang doughnut. I’ve been sick for nine days. My body thinks it’s funny to not let me hear things with my ears. My throat feels like medium grade sandpaper and my voice sounds like that of a dying cow. Sinusitis, I’m done with you. GIVE ME A DANG DOUGHNUT. Do we spell doughnut like dough + nut? Or is it just donut? I think we as a society should come to some agreement here. I feel like “doughnut” is the proper literary spelling and “donut” is the proper lazy person spelling. I’m the kind of person who can’t be bothered to sift flour for a recipe, pretty much ever, but I also think I’m fancy, so I’m going with doughnut. In any case, why don’t you just give me a dang double chocolate doughnut already?!? A baked one! With sprinkles!! I want the rainbow ones, please. Thank you. I’m sorry I yelled at you. With my sad, raspy, bovine voice. That was the sinusitis talking, and sinusitis is dumb. You are my friend. I will share my doughnut. 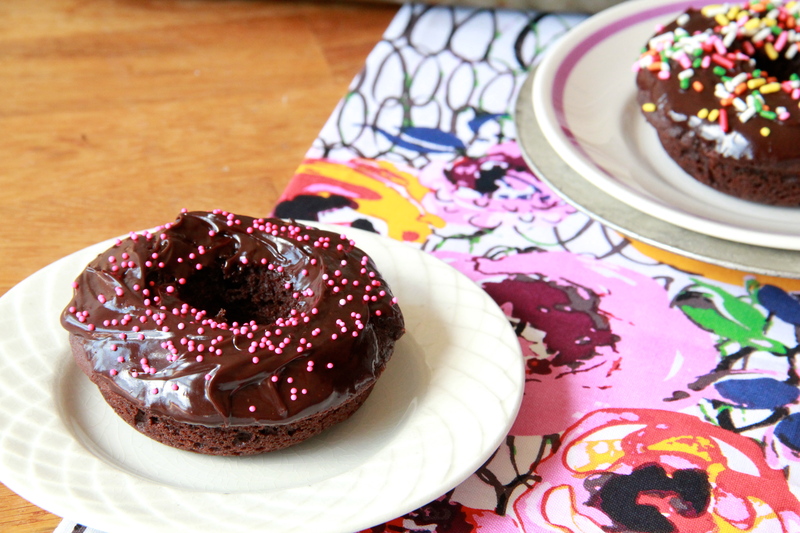 If you don’t have a doughnut pan, you can bake these in a muffin tin instead — just make sure to adjust the baking time accordingly. But if you have the means (the means of approximately ten dollars), you should probably get a doughnut pan, because they’re small (easy to store) and cute (everyone likes cute things) and they make doughnuts. 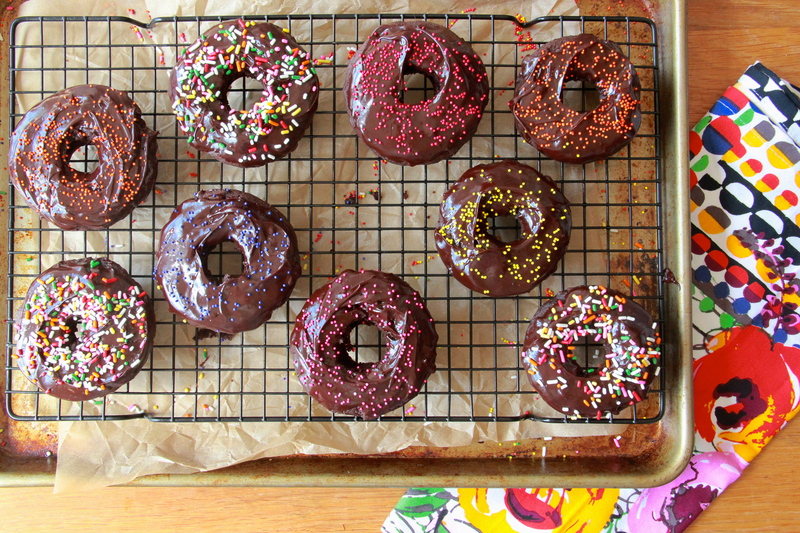 Heat the oven to 325 degrees F. Grease one (or two) 6-cup doughnut pan(s). In a medium bowl, whisk together the flour, cocoa powder, baking soda, salt, and espresso powder until well combined. In a separate bowl, whisk together the yogurt, brown sugar, egg, oil and vanilla extract until smooth. Pour the wet ingredients into the dry, and mix until fully combined. Fill the wells of the doughnut pan 2/3 of the way full – do not overfill. I overfilled a few of the wells (I can never help myself) and ended up with 9 doughnuts, but I think you could get 10-12. 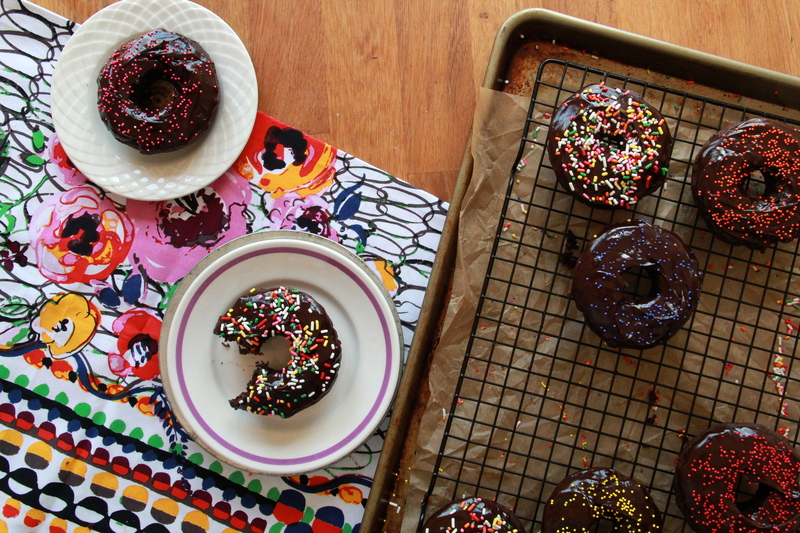 If you only have one doughnut pan, just bake them in batches. Bake the doughnuts 12-14 minutes, until doughnuts spring back when lightly poked. Cool the doughnuts in the pan for a few minutes, then gently turn them out and finish cooling on a wire rack. While the doughnuts cool, make the ganache glaze: in the microwave or over a double boiler, heat the chocolate chips with the milk or cream until melted. Whisk or stir the chocolate and dairy together until silky smooth. 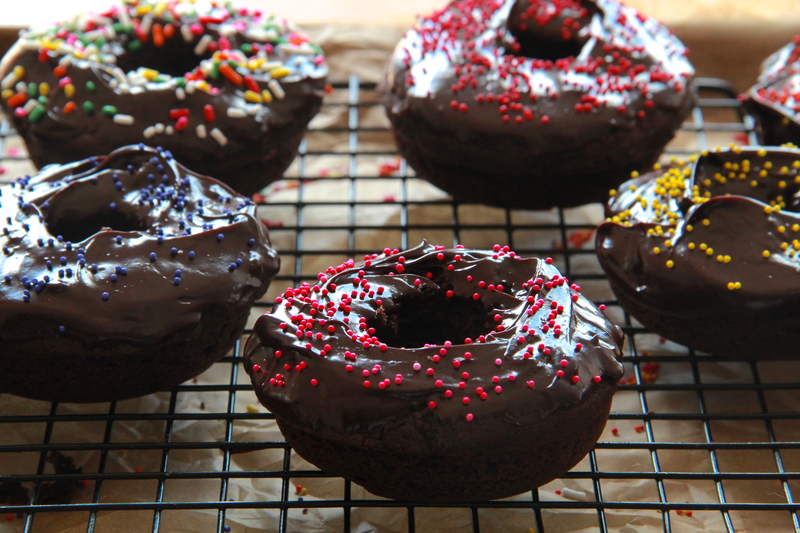 While the ganache is still warm, dip the tops of each doughnut into the chocolate glaze, and top with your choice of sprinkles. Doughnuts are best enjoyed on the day they’re made, but will last, well-wrapped, for 2-3 days at room temperature. I have so come around to baked doughnuts. They are winning me over erryday. And these look sweet!